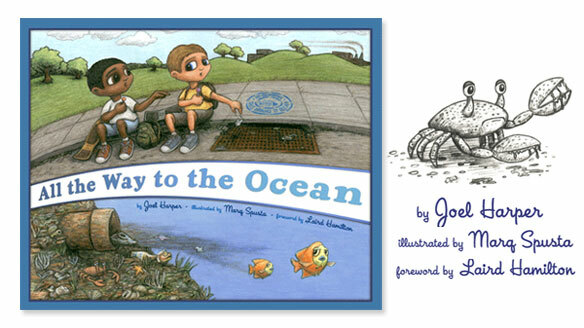 Designed as a children book, Joel Harper’s “All the Way to the Ocean,” illustrated by Marq Spusta, and foreword by Laird Hamilton, delivers a strong message to adults as well about protecting the ocean, keeping our sewers free from garbage, and also about friendship and teamwork. And it is through teamwork that Mr. Harper created this wonderful little book with Mr. Spusta’s colorful, expressive illustrations. What strikes this reader first upon opening “All the Way to the Ocean,” is that it is ostensibly a labor of love.